Ong with one of his pieces. 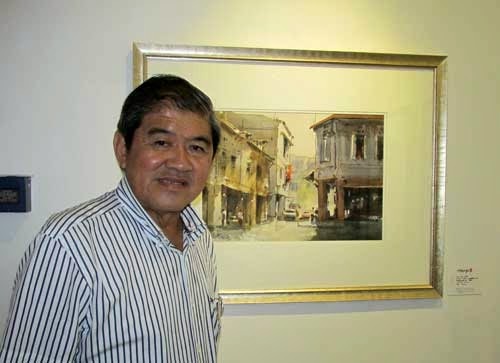 SINGAPOREAN master watercolourist Ong Kim Seng is back with another solo show in the capital. Entitled Different Lands in Watercolour, the exhibition, which is being held at Interpr8 Art Space in Publika Mall, is the artist’s second solo in Kuala Lumpur after his first in 2005. 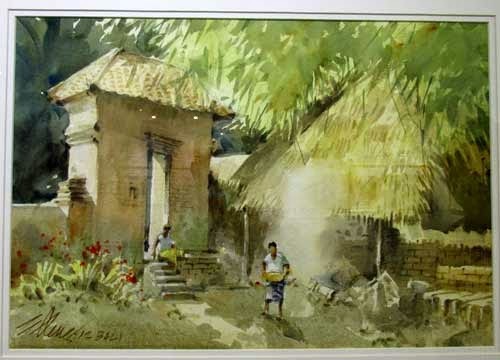 This time, the 69-year-old artist is showcasing 29 exquisite pieces painted plein air at locations such as Bali in Indonesia, Kathmandu in Nepal, Singapore and Malaysia. 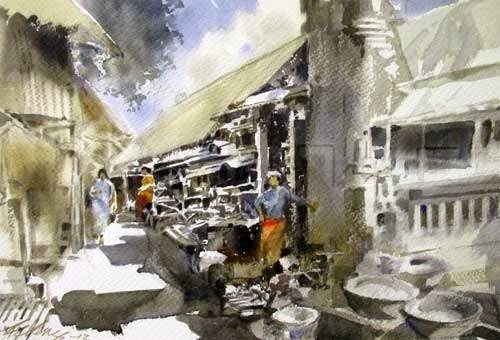 Ong, who has several international accolades under his palette, including honours from the American Watercolour Society (AWS), has also authored a number of books, including bestseller Mastering Light and Shade in 2003. Ong, who has been painting since he was a child, did not consider painting as a full-time profession until 1978 after a Nepali friend threw him the challenge to paint the Himalayas. He not only accepted the invitation but went on to churn out more than 30 paintings in the harshest of weather conditions. “Painting the Himalayas in 1978 in sub-zero temperatures was a most memorable experience for me,” said Ong, who described himself as a “non-outdoor person”. “The low temperatures turned water into ice and hardened the bristles of my brushes. “On many occasions, I had to turn back because of the biting cold and lack of oxygen,” he said. The paintings, which were later exhibited in a one-man show in Singapore, found a warm reception. Eighty per cent of the works were snapped up, with some fetching more than S$2,000 (about RM8,100). Today, Ong’s works adorn the walls of huge corporations and world-class hotels in Singapore and the region. His list of collectors comprise famous personalities, including former United Nations secretary-general Kofi Annan and Queen Elizabeth II. Some of his works have gone under the gavel of renowned art auctioneers, including Hong Kong’s Sotheby’s and Christie’s in Singapore. In China, where Ong has exhibited numerous times, his works have also drawn a loyal following. In the “Different Lands in Watercolour” exhibition, Ong’s fans will be treated to a dazzling display of the artist’s signature style of pitting light against shade in vibrant earthy tones in his visual diary of his travels. From the dusty streets of Kathmandu to pre-war shop houses in the heart of bustling Kuala Lumpur and heritage enclaves of modern Singapore, Ong’s pieces come alive under the spotlight. They give the viewer a glimpse of a moment in time frozen by the artist’s masterly brushstrokes. One can almost hear the rustling of the distant palm trees in a traditional village in Ubud, feel the dust kicked up in a quiet back alley in Kathmandu, or feel the heat of the morning as the sun sets old shop houses in Kuala Lumpur aglow. 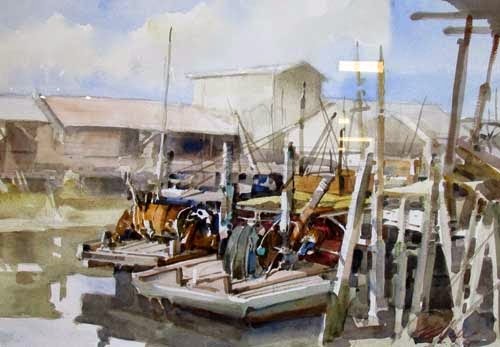 “You have to paint on location to capture the spirit and atmosphere of your subject,” Ong said. “You can paint from photographs but it will not have the same feeling. “When you paint plein air, you are out there, experiencing all that is around you — the smell, heat, and the sounds. “All these make their way into your paintings,” said Ong who has three children. He said his daughter, Dora, was following in his footsteps. “The rest are in other professions because I think they are afraid of the hard life I had to go through as a painter,” he said with a laugh. Ong, who lives with his wife in Singapore, is kept busy with his schedule of exhibitions. This November, for instance, Ong will be exhibiting his Singapore street scenes at the nation’s Art Fair. And, if he is not out painting in a street corner, he will be imparting his skills to his students. The exhibition ends on Oct 31. Interpr8 Art Space is at Block C5, Level G4, Lot 20, Publika Mall, Jalan Solaris Dutamas, Kuala Lumpur. For details, call 012-395 2081.